Arthur A. Levine Books, 9780545518765, 40pp. Ever wonder what it's like to be an author? Does she write in a quiet corner somewhere? Or someplace loud and busy? Does she have ideas forty times a day? Or does she sometimes get stuck? And how does her dog make her lucky? 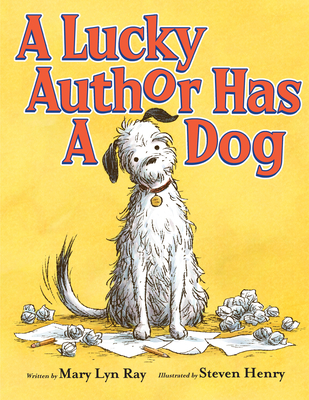 New York Times bestselling author Mary Lyn Ray, together with illustrations from Steven Henry (Ella the Elegant Elephant) that are chock full of hidden jokes, answers these questions and more in a story of one writer, her furry friend, and a school visit that brings authors young and old (and dogs!) together. Mary Lyn Ray has written many acclaimed books for children, including New York Times bestseller and ALA Notable Book Stars, illustrated by Marla Frazee; Pumpkins, illustrated by Barry Root; Mud, illustrated by Lauren Stringer; and Go to Sleep, Little Farm, illustrated by Christopher Silas Neal. Because she always wanted to be a writer, she says a young reader got it right when he wrote to her, "You are the most hapyest author I ever met." She lives on an old farm in South Danbury, New Hampshire, with her dog, who makes her lucky. Steven Henry (formerly D'Amico) began drawing dinosaurs and superheroes at the age of five and was the cartoonist for his high school newspaper. He studied art and design at Cornish College of the Arts and eventually became senior art director at Seattle-based Smashing Ideas. He is the illustrator of several children's books, including the award-winning Ella the Elegant Elephant. An animated TV series based on the Ella books premiered in the United States on the Disney Junior channel in 2014.